Using Reclaimed Tequila Barrels is just one way to help conserve the planets natural resources, and the tequila stool with leather seat is a great example of utilizing these beautiful barrels for future generations. The warm natural colors created from the aging process of Tequila gives these stools a unique and one of a kind color which is then protected with a protective varnish. The stool is covered in and stretched leather and adorned upon a black cast iron base that gives a solid presence to the piece. Approximate Net Weight: 88 Lbs. 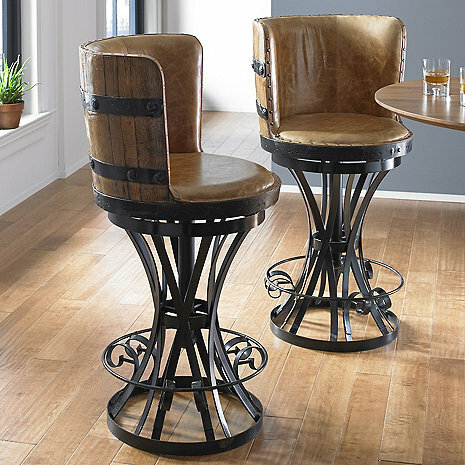 what are the leather colors for the the tequila barrel bar stools item # 324 50 02? BEST ANSWER: I don't believe there is a color choice. The color available, is the color shown in the picture. It is a neutral, light brown color with a slight marbling pattern. If you look closely, you can see it in the picture. barrel, chair backs. We have received so many compliments on our 5 chairs! I believe you will have a very hard time, if not impossible, trying to find a more handsome, classy bar stool! I would call it Cognac...they are very heavy but very beautiful. Hope this helps. They are much lighter in color than pictured. The barrel and leather are what I'd call blonde colored. The leather is buckskin or fawn colored. We are very happy with our stools. A light tobacco or cigar color. Think cuban cigar and you've got it! BEST ANSWER: yes and they are very heavy. The Tequila Barrel Stave Stool with Leather Seat do swivel 360 degrees. Yes, I own 3 and anyone who visits raves about them! BEST ANSWER: The Tequila Barrel Stave Stool with Leather Seat has a seat height of 30 inches. From floor to top of seat pad is 29 3/4" or 2' 5 3/4". Is there a place we can see and sit on these in person? BEST ANSWER: The Tequila Barrel Stave Stools with Leather Seat are currently in our showroom which is located in Valhalla, New York. Thanks for your reply, what does that mean there is no store ro see them in person? Having an issue with sliding the stools in and out of the bar. They are very heavy. Could your recommend something to put on the bottom so they would glide!? We continue to have that issue since they are so heavy....and have not found anything to help.. ?? Thank you for responding. That was very kind of you. If I come across something I'll let you know. We have ours on carpet in the bar downstairs. My husband has to move them. We really did not know how heavy they were going to be. Everyone loves them. Feel free to contact our Sales department at 1-800-356-8466 to see what can be done. dont know about price break but im impressed with lack of padding on seat. How much is shipping for 4 chairs? BEST ANSWER: Please call our sales department at 800.356.8466 and they can assist you with this. Thank you. Can they make these in counter height and if so what is the price? BEST ANSWER: This stool is currently only available in bar height with a 30" seat. It lists the total height as 46", but how high off the ground is the seat? BEST ANSWER: 30" to the seat. The bar stools are beautiful. However, they will be sitting on a tumbled travertine floor and the wrought iron round base will scratch the floor. Do you make a covering that can be slipped on over the round base of the stoolstool? I'm sure the same damage would happen to a wood floor. BEST ANSWER: We do not offer a covering for the base but it will scratch the tumbled travertine or wood floor. I need 4 of these. my question is, I need the seat Height to be 36 inches. is this possible. cant really find what exactly is the seat height. BEST ANSWER: Thank you for your question, the seat height is exactly 30"for the floor. BEST ANSWER: Yes we can order you 5 chairs. why are these made? china? BEST ANSWER: The Tequila Stave Stools are made here in Mexico. I wish to transport these to Australia - is the wood treated? we have received the catalogue for years and finally bought from it when doing a remodel on our home. The stools are outstanding and really make a statement in our bar in our house. Considering that I sell Commercial Foodservice and Seating, this are the best looking barstools I have seen and sat in for a long time. The stools are very nice. They are sturdy too. They look great in my bar. Only complaint are stickers placed on several parts of the metal. All were removed fairly easily. One removed some black paint. I purchased 3 of these fine stools. I found them to be rugged, well made and very comfortable to sit in due to the thick leather seats and the padded backs. I got four of these and they are solid and sturdy and are beautiful - they are actually a bit lighter than the picture shows - which honestly made them look more awesome in real life!!!! They are well made - they are heavy. They brighten up the room I put them in and they are a beautiful addition to the room - exquisite bar stools!!! This is a great looking bar stool. It is high quality and really heavy. The foot rest is a little low for me, but I am below average height. Would recommend this product to anyone. Very well made. Could use more padding in seats. I love the barstools! They are much larger and heavier than I expected. The fact that all 3 were delivered strapped together on a pallet was an issue because they would not fit in the elevator. Luckily the deliver person was kind enough to remove them from the pallet. It would have been much easier if they left the three boxes separate. I'm 5'6" so that's not why foot rails are to low! I kept the stools because my husband can weld so he moved foot rails up for me.